"Sawatdee!" Welcome to our online website about Thailand. We are teenagers from Thailand who want to show you about our country. On our web site you will find lots of information and pictures about Thailand. We are different to other web sites because we are not paid to say good things about hotels and tours. We just tell you the way we see it. If we think a place is expensive or somewhere is not worth visiting then we will tell you. The reason we are making this online guidebook, is that we want to show people how beautiful Thailand really is. Most people think about Thailand as having only drugs & girls. That's really NOT TRUE. Thailand is worth more than that. We have lots of very beautiful beaches, islands, views etc. We also have a very interesting culture. We have chatted on ICQ with some people who think Thailand is not safe but really our country is just as safe as other countries. We also have had lots of e-mail from people asking for pictures and information about places to visit in Thailand. All of this is why we are working on this web site. We can say in a short sentence: "We want to show the real Thailand to people around the world". We think it is working because people write to us saying that they now want to come and visit our country. We hope you enjoy all our fun hard work. Bangkok is one of the world's most exciting cities. Visit the magnificent temples, palaces and museums. Cool out in the parks. Savour the lively nightlife. Plunge into the shops. Gorge on the wonderful Thai cuisine. Take a trip down the Chao Phraya River, the enchanting 'River of Kings'. Founded in 1782, Bangkok is a young city that constantly changes, constantly fascinates. The Thais call it Krungthep, the city of angels. Visitors just call it one of the great experiences. Surrounded by gilded gods, golden spires, and ritual objects of every size and description, the Emerald Buddha looms over the central chamber, seated on his own elaborately tiered gilt mountain, with a delicate spiked parasol of gold above his head. The Buddha's flesh glimmers like moonlight, twinkles like a star in the shadows. There is real magic, real power here that the incredible agglomeration of art and architecture in the rest of the wat somehow misses. Sometimes, less is more. Pattaya is Thailand's premier beach resort and annually attracts hundreds of thousands of pleasure seeking tourists from all over the world. Pattaya's relaxing tropical ambience is perfect for a memorial holiday experience for families, couples and single visitors. Pattaya beach touches the shoreline in a 4 km long arc. The southern beach is well renowned for its night-time activities. The streets alive to the hustle and bustle of the entertainment halls, crowded bars and restaurants. The northern beach is more sedate, well for Pattaya. A few kilometres south of Pattaya is the beach of Jomtien, with a cleaner beach and a cleaner reputation. Pataya is full of water sports. For those of a more sporting nature, indoor or outdoor, Pattaya has the facilities for a whole range of sports that cater for all ages, and all levels of physical exertion. There are bowling alleys, snooker halls, archery and several of the leading hotels have tennis courts. More fun sports are also available; go-karting, parasailing and paintballing skirmishes. An island of contrasts, Phuket has much to offer! White sandy beaches abound the west coast and mangrove lined shores, the east. A range of hills runs down her back from north to south, dividing the island in half. Waterfalls, especially in the 'wet' season spill into rock pools, scattered down the slopes. As to entertainment, whether it's water sports, horse riding, jungle walking, eating out, watching a show, dancing, elephant trekking, or playing golf, whatever your fancy, this island has it all. Phuket and its surrounding water's are world renowned for their spectacular beauty and nature's artistic hand. 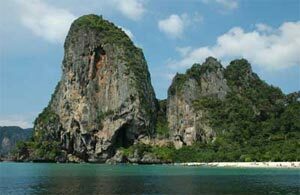 Phang Nga Bay to the northeast of Phuket has been the set of two 'James Bond movies' as well as others. Elephant trekking is a new attraction on the island. SamuiThe name literally means "city of the good people" and is the former seat of the Sivichaya Empire. It is the largest and most important province of the South, located 644 kms. from Bangkok. It occupies an area of 12,891.5 square kilometers bordering on Chumphon and the Gulf of Thailand to the north, Nakhon Si Thammarat and Krabi to the south, Phangnga and Ranong to the west and the Gulf of Thailand and Nakhon Si Thammarat to the east. The historic city of Ayutthaya is an ancient, yet modern, city on an island in the Central Plains of Thailand. It is the capital city of the Ayutthaya province and is around 90 km from Bangkok. It lies at the junction of the Chao Phraya, Lopburi and Pa Sak Rivers. With a population of more than 75,000 people, the city experiences temperatures ranging from approximately 20°C-37°C; November-February is considered as the best time to visit. Ayutthaya was destroyed in 1767 by the Burmese army, but its ruins still remain at the Ayutthaya Historical Park, with the modern town being set among the ruins. The city was declared a UNESCO World Heritage Site in 1991. The cheapest and most scenic way to get to Ayutthaya is by train. However, minibuses and regular coaches from Bangkok are also available. Bangkok, located on the banks of the Chao Phraya River, is the dynamic capital of Thailand. It is also the largest city in the country with about 7,000,000 inhabitants. This wealthy city, which is the 22nd most populated city in the world, receives about 15 million visitors annually. Bangkok is characterised by a tropical climate which remains humid for a major part of the year. The city experiences alternate periods of dry and wet seasons. Dry seasons are warm with high humidity levels while it gets pleasant in the nights. Historically, the city of Bangkok was a small trading centre which has now developed into an important economic and financial hub in Southeast Asia. Interestingly, the full name of the city is listed as the world's longest name of a place in the Guinness Book of Records. Chiang Mai is the second largest and one of the most significant cities in Thailand. Located on the Ping River, it is also the capital of the Chiang Mai Province. Home to a population of about 170,000 inhabitants, Chiang Mai is regarded as one of the premiere destinations in Asia owing to its mix of modern and traditional charm. The climate in Chiang Mai is equatorial in nature with hot, humid summers and pleasant, cool winters. During July to October, monsoon rains bring forth the lush greenery. Winters are the best time to visit as this is when the climate is mild with bright sunshine and blooming flowers. Chiang Mai was founded in 1296 and was a significant centre for pottery, carving and other arts. The city has still retained its glory in the various art and crafts shops. Today, it is a rapidly developing city in Thailand. The average temperatures for Chiang Rai range from 11°C-35°C, with the heat being felt especially between the months of March and April. Maximum rainfall is experienced between July and August. Chon Buri, capital of the Chon Buri province, is located in eastern Thailand. Situated on the shore of the Gulf of Thailand, Chon Buri is about 100 km east of Bangkok. The city has a total population of around 573,000 inhabitants. Chon Buri has an ideal tropical monsoon climate, characterised by the three seasons of summer, monsoon and winter. Till 1960, Chon Buri was a quiet fishing village. Later during the Vietnam War, the American troops used it as a military base. After the war, the province emerged as a popular tourist location. Chon Buri serves as a major agricultural town. The inhabitants of this region indulge in sugarcane farming, fishing and coconut cultivation. Tourism is also a rapidly developing industry. Hua Hin is a famous beach resort town in the northern Malay Peninsula of Thailand. The town is 200 km south of the capital city Bangkok and lies on the western coast of the Gulf of Thailand. Hua Hin is easily accessible from the capital city via the Hua Hin airport which presently caters to domestic flights. The train station is conveniently located in the centre of town. Characterised by a hot and tropical climate, Hua Hin has the lowest rainfall in Thailand. The warm season is usually from November-April, with ocean breezes alleviating temperatures. The population of Hua Hin is around 85,000. The King of Thailand has a summer palace in Hua Hin, which he uses regularly, and as a result, there is quite a lot of security in this region. It is also a good weekend getaway for locals and a lovely retirement option for foreigners. Kanchanaburi is the capital city of the Kanchanaburi Province, which is the third largest in Thailand and stretches as far as the Myanmar border. The city lies at the convergence of the Kwai Noi and Kwai Yai with the Mae Klong River. Kanchanaburi is 150 km from Bangkok, the Thai capital. 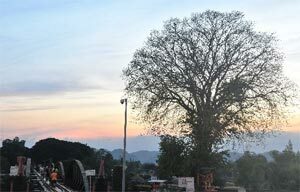 You can use the air-conditioned buses and train services which ply from the capital to Kanchanaburi. You could also avail of special steam trains coming from Wang Pho. The climate of Kanchanaburi is ideal all year round, but people usually prefer to visit during the months of November-February when it is cool with an average temperature of 25°C. July to October sees an abundance of rainfall which is ideal for nature trips. Kanchanaburi has a population of more than 52,000 people. The region is considered to be a major source of Thai blue sapphires. Khao Lak, a resort beach in Takua Pa district, is located in Thailand. It lies in the Phang Nga province and is a popular departure point for scuba-diving trips. The region has a total population of around 5,000 inhabitants. Khao Lak has an ideal tropical climate throughout the year, characterised by two seasons, hot and rainy. The best time to visit is from November to April. December and January are the peak tourist months and are best avoided.Khao Lak was initially a calm and sleepy village until the 1990s, when a few dive operators started offering diving trips to the Similan Islands. The inhabitants of Khoa Lak are mainly Thai and Chinese. Farming and fishing are the two most important sources of economy. Tourism is a rapidly developing industry. Khon Kaen is the fourth largest city in the Kingdom of Thailand. It lies in the heart of the country's north-eastern region and is around 450 km from the capital city of Bangkok. With its rich traditions and Thai heritage, the city makes for a relaxing tourist destination.Khon Kaen is well connected to Bangkok by air. However, for breathtaking sights on the way it is recommended that you travel by train.The city's climate is humid and hot, with average temperatures ranging anywhere between 28°C-38°C. The wet season typically extends from July to October. Khon Kaen has a population of more than 175,000 people. It is the commercial, administrative and educational centre of north-eastern Thailand. It is also renowned internationally for its silk. Ko Lanta is a small island in the southern part of Thailand. Situated between Krabi and Phi Phi Island, it is also known as the ‘Jewel of the Andaman Sea'. Ko Lanta has a total population of around 20,000 inhabitants.Ko Lanta has an ideal tropical monsoon climate, characterised by just two seasons, summer and rainy. The maximum rainfall is during July and August, while the tourist season is from October to May. Historically, the island was a stopover point used by traders from China and the Arab countries. Before World War I, Saladan, the northern part of the island, was the checkpoint for boats on their way to the Malay Peninsula. The cultural groups of Ko Lanta include Thai-Muslims, Thai-Chinese and Chao Ley. Rong Ngeng dance and music, performed by the Chao Ley is an important cultural element. Ko Phangan, an island in the southern Gulf of Thailand, is known all over the globe for its famous Full Moon Parties. Located in the northern part of Koh Samui, Ko Phangan is more popularly known as the ‘Paradise Island of the Kings'. The island has a total population of around 12,000 inhabitants.Blessed with an ideal tropical climate throughout the year, it is best to visit the island from December to March, and June to September. Ko Phangan, initially inhabited by sea gypsies, was discovered by backpackers almost twenty years ago. The island was then settled by Chinese immigrants. King Rama V was known to be a great lover of this island. A majority of the inhabitants of Ko Phangan are Buddhists, Thai being the official language. Coconut cultivation is the main occupation. Fishing and tourism are the other prominent industries. Ko Si Chang is a small, alluring town close to Si Racha, Thailand. This place has an estimated population of around 5,000 inhabitants and is rich in its natural reserves and charming islands. The town is steadily developing into a favoured tourist destination. Ko Si Chang has a tropical climate with three main seasons that dominate most of the southern regions. November to February bring out the mild and warm nature of the climate while March to May is a highly humid and hot period. June to October experiences moderate rains.For long, the town has been a part of the Mu Ko Chang National Marine Park. It has developed recently with the Thai government investing in its infrastructure, such as paved roads and communication lines, as well as building its tourist industry. Ko Tao, also known as the ‘Turtle Island', is an island in Thailand. Located near the eastern side of the Gulf of Thailand, it is home to the famous Hawksbill and Green turtles. With a population of around 1,380, Ko Tao is an ideal vacation spot. Ko Tao has an ideal subtropical climate, which makes it an ideal vacation spot throughout the year. The wet season is from the middle of October to the beginning of December.Historically, Ko Tao was used as an isolated political prison; today, it is known for its beautiful beaches, bays and coral reefs. The region has evolved from a fishing community to a major tourism site. The earliest settlers of Ko Tao were farmers from Koh Phangan and Chumphon, who established coconut cultivation on the island. The main economic activities are tourism, fishing and coconut. Koh Samui is the third largest island in the Kingdom of Thailand. It is located in the Surat Thani province and lies more than 500 km south of Bangkok. The tropical island, roughly circular in shape, is situated in the Gulf of Thailand. Koh Samui has an airport with daily flights to Bangkok, but many tourists prefer using the night train, buses and ferries to avail of cheaper options to reach the island. The island has a temperate climate with warm sunny temperatures that usually stay above 25°C. February to May is considered the hottest time of the year, and October to December generally isn't advisable for a visit owing to the heavy monsoon.Koh Samui has a population of nearly 50,000 people. It is surrounded by at least 60 sister islands which constitute the Ang Thong National Marine Park. Krabi, a charming town situated at the border of the Krabi River is the capital of the Krabi Province. The town, home to a population of about 25,000 residents, boasts of some beautiful mainland beaches and seaside cliffs. A natural scenic beauty, Krabi has one of the best beaches and bays in Southeast Asia. Krabi is typified by a tropical climate which stays warm all year round. The period from November to March witnesses a pleasant, breezy weather while May to October is the monsoon period. February to April is the best time to visit owing to good weather.This enchanting town was a small community about ten years ago; today, it is a lively city bustling with activity. The town has developed into a major tourist spot for its beaches and various recreational options. Lampang, also called Nakhon Lampang, is an ancient seventh-century city and the capital of the Lampang Province in northern Thailand. It is the third largest town in the northern region of the country and lies on the banks of the Mae Nam Wang River, which also flows through the city. Lampang is around 600 km north of the capital city of Bangkok, and the two cities are connected by daily flights via the Lampang Airport. A train service to the crowded tourist city of Chiang Mai (around 100 km south) also stops at Lampang. The city experiences a dry climate. Winters are dry and sunny with temperatures dropping below 10°C in the night, and summers, from March to June, can be sweltering with temperatures soaring above 40°C. Afternoon thundershowers are a normal occurrence. Lampang city has a population of more than 52,000 people. Mae Hong Son is the capital of the province of Mae Hong Son, Thailand. This small and sleepy town lies on the banks of the River Pai and is located close to the Myanmar border. It is also said to be Thailand's second northernmost provincial capital. The town is served by the Mae Hong Son Airport, although it is possible to reach the town by road from the nearby tourist city of Chiang Mai. Climate in Mae Hong Son is much cooler than the rest of Thailand. The town is covered with mist most of the year and earns a nickname of ‘the City of Three Mists' because of the dewy mist in winter, the rain mist in the monsoons and the forest fire mist in summer. The best and most scenic time to visit is between November and April. The population of Mae Hong Son is more than 6,000 people, which includes various hill tribe communities living in the region. Nakhon Pathom, a town in Thailand, is the capital of the Nakhon Pathom Province. An ancient city with a history dating back to almost one thousand years, Nakhon Pathom houses around 800,000 inhabitants. This rich city is an amalgamation of green fields, orchards and rivers. Nakhon Pathom's climate is of the tropical variety characterized by monsoons. Summers are warm and humid. The climate ranges from dry to humid. November to February is the best time to visit the place. The name Nakhon Pathom means ‘First City' which is why it is regarded as the most ancient city of Thailand. Due to the ideal conditions for crop cultivation in the city, the economy is based mainly on agriculture. Nakhon Ratchasima, or Khorat, is the capital of the Province of Nakhon Ratchasima, which lies in the north-eastern region of Thailand. 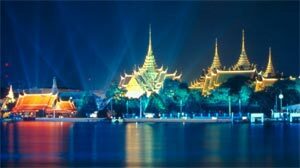 It is situated about 260 km north-east of the country's capital city Bangkok, on the banks of the Mun River. The city serves as a gateway to the lower areas of the Isan region. The three-hour drive from Bangkok treats you to some spectacular scenery on the western edges of the Khorat Plateau, as does the picturesque train ride on the North-eastern rail line. The summer season extends from February to May, while the winter season is between October and February. The average temperature in Nakhon Ratchasima is around 25°C. The population of the city is estimated to be more than 150,000 people, making Nakhon Ratchasima the third largest city in Thailand. Nong Khai is the capital of the Nong Khai Province in the north-eastern Isaan region of Thailand. This town lies on the western banks of the Mekong River. The Thai capital, Bangkok, is over 600 km from Nong Khai. The city is also the terminus of the railway line from Bangkok. Nong Khai is a border town and the site of the Thai-Lao Friendship Bridge connecting Thailand with Laos. Vientiane, the capital of Laos, is just 20 km from Nong Khai. Vietnamese culture and influence is reflected in the architecture and the cuisine of the town. Nong Khai has hot summers with a maximum temperature of 35°C and chilly winters with minimum temperatures of 11°C. The population of Nong Khai is more than 50,000 people. Tourism is an important mainstay of the town's economy, with tourists to Laos often visiting Nong Khai. An internationally well-known seaside resort, Pattaya is located approximately 170 km southeast of Bangkok on the east coast off the Gulf of Thailand. The town stretches over 15 kilometres along the coast. With a population of more than 96,000, it is a melting pot of different nationalities. Every year it welcomes more than 5 million visitors. The best period to visit is November to February, when the weather is nicely warm - 20° to 30° - and dry. February to May is the hot, dry season with occasional rain and spectacular thunder storms. The monsoon season is June to October, with heavy rain, 90% humidity and temperatures 25° to 35°. Phang Nga is the capital and administrative centre of the Phang Nga Province in southern Thailand. It lies nearly 100 km north-east of Phuket and 800 km from the capital city of Bangkok. Phang Nga has plenty of small islands with jutting limestone formations located in the Andaman Sea (which lies to the west of the town). The town has managed to keep itself away from the hustle and bustle of the overcrowded Phuket. The tropical marine climate is perfect for all year round tourism, with high rainfall during the monsoon season from May to October. The town also experiences warm conditions with average temperatures ranging between 23°C and 33°C. Humidity in Phang Nga is around 83%. The town has a population of more than 20,000 people. Agriculture and tin-making are some of the primary industries in the area apart from food crops. Phetchaburi, or Phetburi, is the capital of the Phetchaburi Province in central Thailand. The Phetchaburi and Bang Tabun rivers pass through the city, with the Khao Wang hill dominating the otherwise flat terrain. The city lies on the western shores of the Gulf of Thailand. Phetchaburi is around 150 km south of the capital city of Bangkok and 50 km north of Hua Hin. There are regular bus and train services plying from the capital. The average temperature in Phetchaburi ranges between 16°C and 38°C, with the monsoons arriving in July and lasting till October. The city has a population of more than 25,000 people. Agriculture and fishing are important occupations of the inhabitants. Of late, tourism has been gaining importance because of the history and heritage that Phetchaburi showcases. Phi Phi Islands, known as the ‘Jewels of the Andaman Sea', are a tiny group of islands located between the large island of Phuket and the western coast of mainland South Thailand. The islands, home to around 2,000 people, are divided into two parts: Phi Phi Don (the larger group and the principal of the two) and the smaller Phi Phi Leh; together they comprise the Phi Phi National Marine Park and form an extension of the mainland Krabi province. Destination Air Shuttle, the country's sole seaplane shuttle, flies to Phi Phi from the Phuket International Airport. You can also take a pleasant boat ride from Krabi's Chao Fah Bridge Pier. The summer season in Phi Phi is between November and April, while the laden monsoon rains fall from May to October. Average temperatures are between 17°C-37°C. Phuket is a city situated in Phuket Islands, Thailand. It is a small town with an active economic centre, appealing colonial architecture and riveting beaches. Phuket was incorporated as a city in 2004 and is home to a populace of about 60,000 people. The city is characterised by a tropical monsoon climate with year-round warm temperatures. Phuket possesses two main seasons, dry and wet, owing to the monsoon winds. April to May is the hottest period, while October and November are the coolest months. The name ‘Phuket' originates from the word ‘bukit' which means a hill. Phuket city is an interesting blend of traditionalism and modernism. Its growth-oriented economy consists of tin mining, agriculture and marine products. Ranong is the capital of Ranong province in southern Thailand. It is a principal town in the Mueang Ranong district and lies at the estuary of the Pak Chan River. The Kra Isthmus (the narrowest part of the Malay Peninsula) is located here, facing the Indian Ocean. The town is a gateway to Myanmar, bordering the country at the Burmese village called Victoria Point. The Ranong Airport lies 20 km south of the town, while the Phuket-bound buses from Bangkok always stop at Ranong. Ranong is the wettest region in Thailand with rain lasting for around 8 months in a year. Average temperature is around 27°C. The population of Ranong is estimated to be more than 20,000 people. Apart from being a laidback tourist town surrounded by mountains and forests, it is also one of the largest fishing ports in Thailand. Rayong is a scenic city in Thailand and the capital of the Rayong Province. Located close to the Gulf of Thailand, Rayong is a major agricultural and industrial centre of the country. Home to a population of about 54,000, the city is also a favoured tourist destination. The city is defined by a tropical climate which is humid in nature. Frequent rains are experienced in this region. Although the temperatures are high, cool breezes temper the heat to a great extent. November to February is the best period to visit for the pleasant climate. Historically, Rayong has been witness to various battles and takeovers. However, it continued to develop its economy relying heavily on fishing and agriculture. Today, it is a major industrial centre with rubber, manufacturing and the port industry being the main components. Songkhla is a sleepy coastal town and the capital of the Songkhla province in Thailand. The town lies on a narrow peninsula which separates Lake Songkhla (the largest inland lake in the country) from the Gulf of Thailand. This location makes it an important harbour town. Songhkla lies near the Malaysian border and is 720 km from Bangkok. The neighbouring city of Hat Yai has an airport offering services to Bangkok twice a day. Buses leave from Bangkok several times a day. Average temperatures are around 25°C, with a notable difference in the warm, cold and monsoon seasons. Songkhla has a population of more than 75,000 residents. The town is an important educational centre in southern Thailand and is one of the most beautiful seaside resorts in the region, untouched by the adverse effects of mass tourism. Sukhothai is an ancient city in Northern Thailand. It was founded as early as the twelfth century and used to be the former royal capital of the country. New Sukhothai, which is the modern version of the city lying 12 km away on the banks of River Yom, is located in this historically significant city. Sukhothai lies around 430 km north of Bangkok, with comfortable air-conditioned buses offering frequent services to the city. Those with private vehicles will enjoy the ride from Bangkok as they can observe rural Thailand more closely. The Sukhothai Airport is around 40 km north. Average temperatures in Sukhothai range between 16°C and 36°C, with the months of March and April being the hottest; the period between August and September is the wettest time of the year. The population of Sukhothai is around 40,000. Surat Thani, capital of the province Surat Thani, is located in Amphoe Mueang, Thailand. A commercial centre and a port, Surat Thani, with a population of around 126,000 inhabitants, is located near the river Tapi on the Gulf of Thailand. Surat Thani enjoys a tropical climate, characterised by the three seasons of summer, rains and winter. The best time to visit the region is from April to November. Historically, King Rama VI named the city Surat Thani due to the high devotion of the inhabitants towards Buddhism. Since 1969, the city is the seat of the Roman Catholic Diocese of Surat Thani. Surat Thani is the main commercial centre of the Surat Thani province. The city is also home to a seaport. The main produces of the city are coconut and rubber, while fishing is a major source of income. Ubon Ratchathani, also called Ubon, is the capital city of Ubon Ratchathani Province in Thailand. The city is located south-east of the Isaan region and lies on the banks of the Mun River. Ubon is one of the country's largest provincial capitals and is more than 600 km north-east of Bangkok. The Ubon Ratchathani-Muang Ubon Airport in the north of the city is a dual international airport and a Royal Thai Air Force Base. There are daily rail connections with Bangkok. Ubon lies around 100 m above sea level and has average temperatures of around 25°C. However, during summers temperatures can rise up to 30°C or more. The population of Ubon is estimated to be more than 100,000 people. With its natural wonders, heritage attractions and silk producing centres, Ubon Ratchathani is a popular Thai tourist destination.